Floating World Comics is proud to usher All Time Comics to the next level of comics greatness with the release of new issues and a collection of the fan-favorite first season. On May 2 join new series co-writer Josh Simmons to celebrate the release of All Time Comics Zerosis Deathscape #0, which Josh also illustrated! Original art from issue #0 will be on exhibit all month. 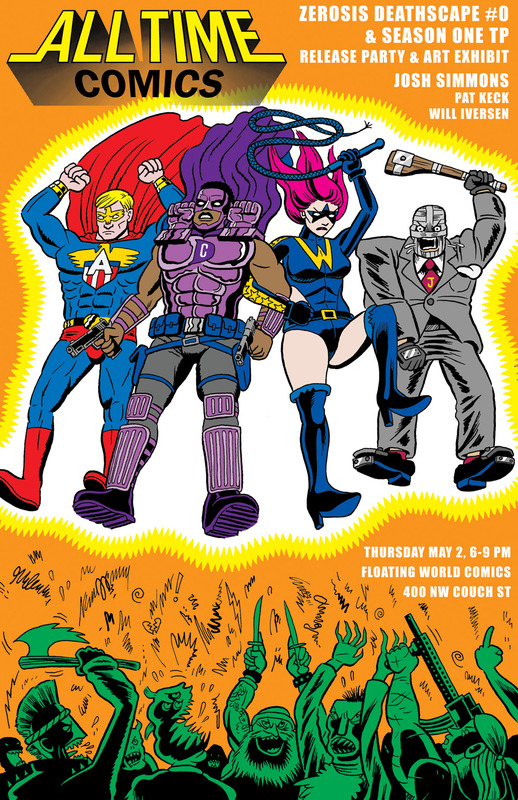 We will also have advance copies of All Time Comics Season One TP available before its official June release. Written and illustrated by Josh Bayer and Josh Simmons, with inks by Ken Landgraf, this zero issue is the perfect intro to the new wave of ATC. Features the first appearance of The Red Maniac, and we meet Time Vampire Scientist, who foretells death and destruction with the dawning of the Zeroverse!